I didn’t write as many articles this year as last year (28 vs. 32) and my word count is lower (27,000 vs. 38,000). However, I stayed closer to the theme: more than half, almost two thirds I think, of all posts were related to Polyhedral Pantheons. This includes drafting 72 deities across three pantheons (halfling, goblin, and elemental-focused), which in turn were split into 10 subpantheons. This was a lot of writing for the book, and I am very pleased with how they turned out. I am almost done drafting Polyhedral Pantheons, and I should be able to finish the last bits this week and start reviewing. Only one post missed the correct day, and was still posted only 12 minutes late. All other posts were the night before, if sometimes by less than an hour. All things considered, I am satisfied. Total 27,444 About 11,000 fewer words than last year, but still 1/2 of a NaNoWriMo target. 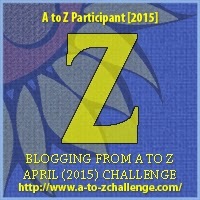 2014-04-29 Z 1,166 Z-A Challenge 2015 Index This post, summarizing the articles I’ve written for this year’s A-Z Blog Challenge. 2014-04-29 Y 457 Yet More Projects I never seem to run out of things I’d like to do. Here are some of the projects I’d like to find the time and energy for. Stupid ‘regular working hours’ and ‘sense of responsbility’…. 2014-04-28 X 923 Examples of Adapted Polyhedral Pantheons I worked two examples of the adapted polyhedral assignment mechanism, one for physical geography that leads to a campaign premise I wouldn’t mind exploring (aberrations teaming up with dwarves against the goblins, with a dwarf/goblin counteralliance resisting them) and one preparing a template for use creating cities in a particular culture using Last Gasp Grimoire‘s In Cörpathium dice drop mechanism. 2014-04-27 W 2,176 Working on Polyhedral Adaptations Expansion of Variations on a Theme: Adapting Polyhedral Pantheons, drafting lists of attributes that can be applied for each purpose. 2014-04-26 V 2,178 Variations on a Theme: Adapting Polyhedral Pantheons Seven ways the polyhedral assignment mechanism used by Polyhedral Pantheons can be applied to other purposes: physical geography, planar geography, city wards, characters, 13th Age-style icons, megadungeons, and campaigns. 2014-04-24 U 2,077 Ultimate Shu-shi Deities Post The remaining ten members of the Shu-shi pantheon, the ultimate (i.e. last) post on the Shu-shi deities, and as is happens also the last post of draft deities I plan for Polyhedral Pantheons. 2014-04-23 T 2,332 Twelve Shu-shi Deities Twelve of the twenty-two members of the Shu-shi pantheon. I started with the six Jixiang Shen (auspicious deities favored by the Shu-shi) and the six Bukeishiyi Shen (the uncanny deities that make Shu-shi uncomfortable). 2014-04-22 S 800 Shu-shi Pantheon (Halfling Pantheon Revised) I didn’t feel really good about the original halfling pantheon, but stumbling on the idea of Chinese culture merged with halfling sensibilities resulted in a revised pantheon I feel really good about. 2014-04-21 R 1,601 Reviewing the Elemental Tetratheon The Elemental Tetratheon is a largish thing and deliberately polarized, focusing on the hermetic elements. I reviewed it to be certain it covered everything I needed it to. This post has the full deities table, examines the domain allocations by deity within each element, and domain access by alignment (both ‘domain by deity having this alignment’ and ‘domain by alignment of cleric’, which must be within one step of the deity). 2014-04-20 Q 372 Quick Update on Polyhedral Pantheons An review of the Polyhedral Pantheons outline I had prepared. Some things added, more things dropped, many things changed. I’m actually getting close to having a complete draft. 2014-04-20 1,657 Water Deities of the Elemental Tetratheon Drafted the water deities of the Elemental Tetratheon. Bonus post, I needed the material for review. 2014-04-20 1,478 Air Deities of the Elemental Tetratheon Drafted the air deities of the Elemental Tetratheon. Bonus post, I needed the material for review. 2014-04-18 P 637 Points and Nodes and Paths, Oh My! Describes nodecrawl/pointcrawl adventuring, a pathcrawl variation, and a transitional nodes variation that can apply to all three. Includes many links to relevant material. 2014-04-17 O 1,250 On Wandering Monsters and Random Encounters I went back and revisited some previous thoughts I’d had on wandering monsters. This time I described in a little more detail how I choose what to put in a random event table, and how this in turn related to how I design campaigns and adventures. 2014-04-16 N 554 Naming Things with Style I’ve talked before about how I name things, but a comment about how the names within the sample pantheons seemed so natural and internally consistent in style caused me to explain again how I often devise names for setting entities. 2014-04-15 M 367 Musing on Spell-Like Abilities in Echelon Jumped track a bit to ponder a design problem I’ve been having in another project. 2014-04-14 L 453 Lusus Naturae is Live in PDF The Kickstarter project closed April 12, 2014. Rafael made the PDF available on April 13, 2015. A bit behind schedule, and we’re still waiting for the physical books, but they’ll be here soon enough. 2014-04-13 K 1,439 Kouzelnik Deities of the Goblin Pantheon The kozelnik, on the other hand… take a chaotic race with violent tendencies, then make them lawful and watch their minds snap. It seems pursuit of alien lore and ‘jatemst’ (nobody knows what ‘jatemst’ is, but the kouzelnik swear they’ll recognize it when the find it) has done something strange to them. 2014-04-11 J 1,565 Jhesiri Deities of the Goblin Pantheon, Rewritten The jhesiri are still focused on destruction, but the rewrite makes them much more credible. The original was hyperbolic, this makes much more sense and feels almost believable. 2014-04-10 I 563 Icosahedral Pantheons I started drafting text describing why someone might use various polyhedrons. I suspect I’ll reduce this to a summary paragraph in the book. It’s a good thing I’m reviewing my posts, I forgot to finish these! 2014-04-09 H 1,402 Hilljack Deities of the Goblin Pantheon Reclusive and insular, the hilljacks would as soon be left alone. They are not nearly as malicious as most other goblins, but they are still opportunistic and will take advantage of situations if they come up. 2014-04-08 G 642 Goblin Pantheon Revisited The original goblin pantheon was over-exaggerated, I think, to the point of being caricature. I revised the domain assignments and started over, and I think ended up with something much better. 2014-04-07 F 1,307 Fire Deities of the Elemental Tetratheon Drafted the fire deities of the Elemental Tetratheon. 2014-04-06 E 1,221 Earth Deities of the Elemental Tetratheon Drafted the earth deities of the Elemental Tetratheon. 2014-04-04 D 1,163 Designing Dynamic Spells Revisiting another old topic, this time about families of very similar spells and how they can be reduced to a smaller number of more dynamic spells. 2014-04-03 C 754 Composition of an Autoscaling Magic Item Notes about how an autoscaling magic item might be designed and written up. The idea needs work; the example I explored didn’t work out to my satisfaction, it lacks elegance. 2014-04-02 B 592 Background Information on Autoscaling Magic Items Background research into other attempts at autoscaling items. The theme has been examined before and I wanted to be aware of the prior art. 2014-04-01 A 1,385 Autoscaling Magic Items Prompted by reading the Legendary Items series from Purple Duck Games, I thought I’d take a look at magic items that scale with the levels of their wielders.